When plans have gone to hell, when your commandeered short bus is going up in flames...that's when you need a bug out bag. As popular as bug out bags are, their role in survival/preparedness plans is often misunderstood. You'll often hear stuff like "Man, bugging out is crazy! I'm going to bug in and stay home!" or "Why would I choose to be a refugee with nothing but a backpack on my back?" And then on the other hand, you'll have others who for some reason plan to start marching off into the woods with a giant pack to pitch a tent, hang out and start bush crafting. It's all too common, and unfortunately both are completely missing the point. I agree - bugging out shouldn't be your primary plan. Or even your secondary. Yep, you'll want to bug in...at least as long as it is safe to do so. If you're forced to leave your bug in location and retreat to safety, you'll want to load up your truck/SUV with every possible thing that you can for that journey. Gear, food, water, fuel...heck, hook up that bug out trailer, too. There are of course various things that can go wrong or draw you away from your vehicle. Crash, break downs, getting stuck, running out of fuel, getting hopelessly stuck in traffic, floods, impassable roads, attacks on your vehicle...or, even just heading out on foot for a scout/patrol of an area. That's when you want your bug out bag. 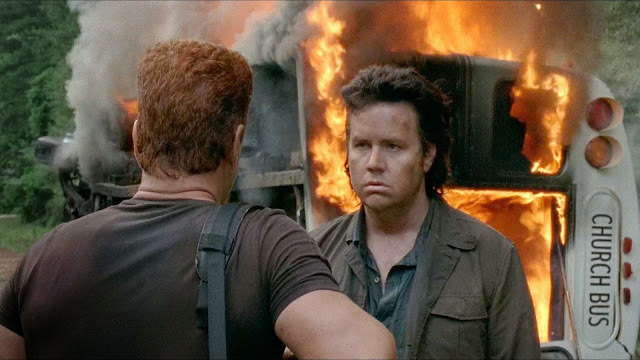 In the Walking Dead screen grab from above, they crashed their short bus and it burst into flames. Crap - there goes their transportation as well as the majority of food and weaponry they appeared to have brought along for their journey. In You Took Away Tomorrow, the characters first attempt to bug in at Jack Rourke's home. Then, when their home is compromised, they try to bug out via their vehicles. When the group's makeshift convoy falls under attack from machine gun wielding neo nazi bikers, they resort to a bug out on foot. Soldiers and especially contractors in Iraq and Afghanistan have been well known to carry 'go bags' in their armored SUVs - small bags that they can grab during an attack. They pack them with spare mags, medical gear, radios, smoke grenades and other assorted cool guy stuff to help them get back to safety or hold out until rescue arrives. An example of a 'worst case' for this in action. This was shared by a recent Haley Strategic class participant - think instead of just grabbing long guns, they'd be throwing on bug out bags as well. In my opinion, a bug out bag should work in this kind of environment and scenario. You should be able to move quickly, even move and shoot while wearing it. It should also be of a size 'works' around a vehicle and can be retrieved and donned quickly if needed...not some giant hiking pack that you can barely lift. If you had gunfire (or quickly rising flood waters, or fire, or whatever) coming in your direction, how long would you spend screwing around with a pack? Be able to grab and move - that's the point.